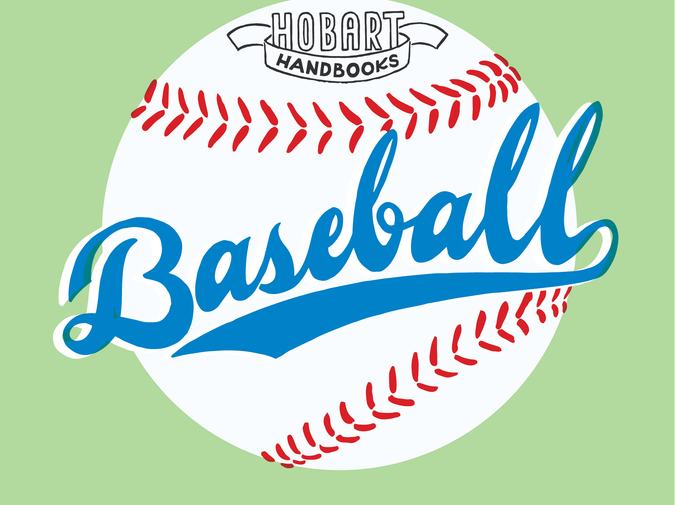 Hobart :: Introducing: Hobart Handbooks! Because I procrastinated, I am writing this Intro the day before I’m to send the completed book files to the printer. But it also means, coincidentally, I am writing it only a few days after going to my first baseball game in a couple of years. I’m not sure how that happened, how those seasons and years passed me by. I’ve never been the most regular attendant, but I’ve almost always found the time to go to a game or two every season. Like at least a couple of the contributors mention in their back-of-this-book author notes, you get older, priorities change, years pass. Life happens. In 2003, Hobart was only a year and a half old, and I was still scrambling until the last day of every month to put together an issue of the website for the coming month. At some point in March of that year, I realized how excited I was for the approaching baseball season, and how many of the writers I knew were also baseball fans. I had the idea that this excitement should be represented on the site, so I emailed a few friends, asked if they had any baseball-related short stories or essays that they would let me publish, or if they might be interested in trying to write something in the next week or two. Nearly everyone responded with similar enthusiasm, and thus was the birth of our annual baseball issue, every April. Of course, there was no idea of it being an annual tradition at the time. There was certainly no idea Hobart would still exist twelve years later. It’s become fun, and an honor, to every year hear people say that they look forward to our baseball issue as much as Spring Training, that Hobart is as much a part of their Spring as the return of baseball itself. I’ve tried, over the years, to explain “why baseball.” Because of its literary history, I’d propose. Because it is the most narrative sport, because it has the greatest opportunity for metaphor. But, really, it’s just because I like it. I grew up playing catch and backyard homerun derby, collecting baseball cards, going to games with my dad. That’s always been the most fun aspect of Hobart—having an idea and following it through. Because… why not? It rarely mattered how silly or goofy seeming the idea, and we never really put any consideration into if readers might share our enthusiasms. What mattered was that we found the idea interesting, fun...it excited us. It turns out, if you follow where your excitement takes you, others will probably follow. And so, that’s become something of a mission statement, for our journal that never had much interest in mission statements. We’ve had the idea and wanted to do some kind of “best of our online baseball issues” for years, and here is one iteration of that book. We’ve been doing it for so long (this year is our 13th! ), we have too many favorites, so we made some arbitrary rules. Though we’ve been foremost devoted to fiction as a journal over the years, we found ourselves pulled toward some of the baseball creative nonfiction we’ve published, and the fiction that felt like, or played with, nonfiction. Stories about Dock Ellis’ famous LSD no-hitter, Herb Washington as the only “designated runner” in MLB history, Jim Joyce and his blown call that cost the Detroit Tigers’ Armando Galarraga a perfect game. That baseball game a few days ago was an afternoon weekday game. Sunny, blue skies, 72 degrees. Detroit Tigers vs. Oakland A’s. It was a beautiful day, but a rough outing for Detroit—they were down 3-0 in the 2nd, and Yeonis Cespedes was taken out of the game for “flu-like symptoms,” replaced in leftfield by Daniel Fields, making his major league debut. Only a couple innings later, Fields let a groundball single get by him, an error that let a couple runners score in his first game as a major league baseball player. OAK 6 – DET 0. Down 7-1 in the bottom of the ninth, half of the stadium already empying out, Fields started a rally with a double. Kinsler singled him home, J.D. Martinez hit another single, and Tyler Collins hit a homerun. The game seemed out of reach only moments earlier, and now Detroit was down by only two. The rally died there, the Tigers losing their seventh straight, but it still felt special. We witnessed someone hit their first ever major league base hit, and because of the magic of baseball, and the dependence on outs instead of time limit, anything seemed possible. And what better way to think of literature, as anything being possible.